Not only is breakfast the most important meal of the day, it’s also the most enjoyable one, and boy does Austin know how to make a mean breakfast. There are a number of great breakfast spots popping up all over Austin making it their mission to ensure that your day starts well. Pancake connoisseurs beware! If you haven’t been to Kerbey Lane Café in Austin, then you haven’t truly lived. Serving up the best pancakes in town, Kerbey Lane is a must if you crave these full saucers of sweetness at all times of the day. They’ve got all kinds of pancakes on their menu, such as buttermilk, apple whole wheat, blueberry, or gingerbread pancakes. Kerbey Lane even has weekly or vegan special versions of their pancakes to make sure they’ve got something for everyone. Want a gluten-free pancake? Yup, they’ve got them. Kerbey Lane Café’s huge breakfast menu also has menu items like the crispy chicken Benedict, chilaquiles, and the Kerbey Scramble. 24 Diner is an American-style diner in Austin, originally opened in 2010 as part of the ELM Restaurant Group. The diner, which takes its cues from traditional 1950s-style roadside diners, is helmed by executive chef Andrew Curren, a graduate of New York City's Culinary Institute of America. Dishes are served up 24 hours a day, highlighting locally-sourced farm-to-table fare whenever possible. Favorite entrees include the restaurant's signature meatloaf with sweet onion gravy, veggie hash, and bacon gorgonzola burgers topped with fried eggs. Brunch and breakfast items include Southern-style favorites such as chicken and waffles, biscuits and gravy, and goat cheese frittatas. A wide variety of decadent milkshake flavors are served up, along with craft beers on draft and boutique wines by the glass. Paying homage to the city and the Heritage Society, the 1886 Café and Bakery is reminiscent of the lunchroom that was founded and staffed by the Heritage Society for over 20 years back in 1886. The 1886 Café and Bakery, which was opened on July 4, 2002, is located in the busy corner of Sixth and Bravos streets within The Driskill hotel. Today, the café is a busy gathering place for locals and out of town visitors alike, thanks to the mouthwatering Texan comfort food and breakfast classics on menu. If you’re new to the 1886 Café and Bakery, some great breakfast dishes to try are the Bravos Huevos Rancheros, the N.Y. Steak and Eggs, and the Austin American Breakfast. In a meat-loving state like Texas, vegetarian fare might be difficult to find. Enter the Bouldin Creek Café, a snug little coffee shop that makes vegetarian-friendly breakfast fare for all plant-based foodies in the city. Chow down on meals like the El Tipico, a plate full of their famous tofu scramble, made-from-scratch herbed potato hash cake, local tomatoes, shredded lettuce, house-made salsa, and your choice of tortillas. The Tamale Breakfast is equally appealing, with its two sweet potato pecan tamales served with a side of tofu scramble, house-made salsa, beans or fruit, and tortillas. Not a fan of tofu scramble? No worries! You can choose to have organic pasture-raised eggs served with your meal instead of the tofu scramble. 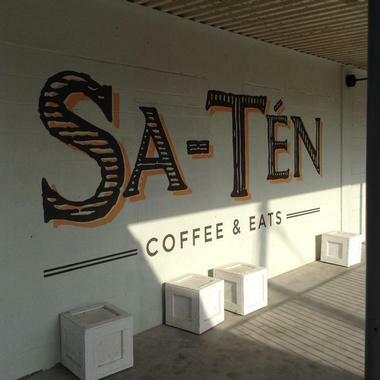 No place in Austin does a California-inspired breakfast quite like Café No Sé! Located in the South Congress Hotel, this all-day café features seasonal breakfast offerings in addition to spectacular lunch and dinner fare. Frequent guests also rave about the weekend brunch. If you’re the kind of person who enjoys a light breakfast, try their red quinoa porridge, which is served with kiwi, strawberries, cocoa nibs, and toasted pistachio. Another light breakfast option is their avocado toast, topped with a beautifully soft-boiled egg, creme fraiche, upland cress, and Aleppo carrots. 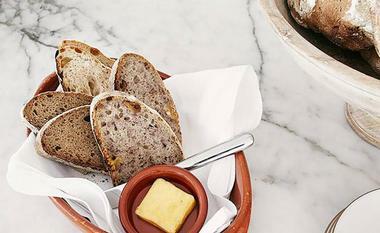 For a heartier meal, try the loaded gravlax bagel or the ricotta hotcakes. 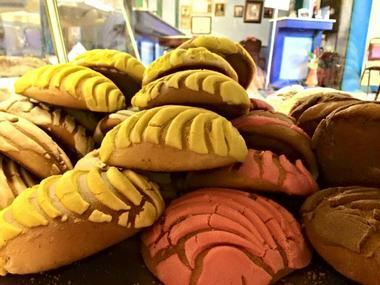 Tex-Mex, grease, and side of good old Austin political history is exactly what Cisco’s Restaurant and Bakery is all about. Cisco’s may not be the newest or fanciest restaurant on the block, but eating good food isn’t always about hitting up the trendiest joints in town. 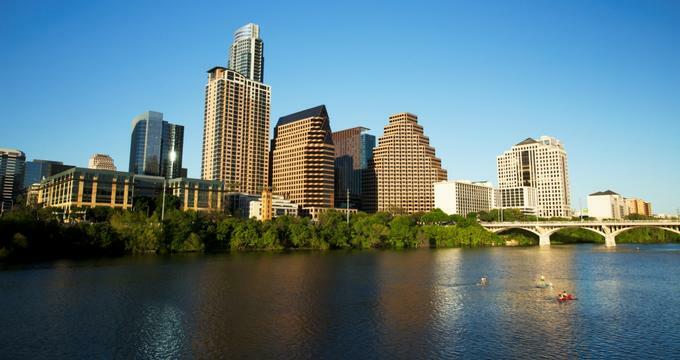 At Cisco’s it’s all about the food and a side helping of history, and that’s why they’re known for serving the best breakfast that Austin has to offer. Already 62 years into their operations, Cisco’s is legendary for their migas, their huevos rancheros, and their delicious (and complimentary!) biscuits. You might not believe it, but Cisco’s is actually a hot spot for the city’s politicos to hang out and even saw the likes of Lyndon Johnson during his day in Legislature. The thing that makes a diner truly great is their breakfast. Period. You can’t even think of calling your diner good if the breakfast offerings aren’t up to par. 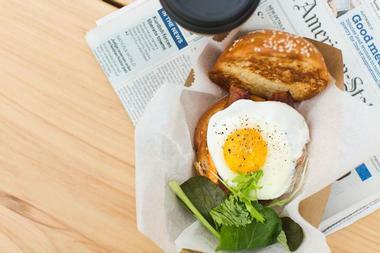 At Counter Café, they do the first meal of the day justice. Not only can you look forward to having eggs any which way you like them, you can also tuck into delicious hotcakes, a filling bowl of porridge, and more. Other crowd pleasures on the menu are the grilled pimiento cheese sandwich, the Counter Benedict, the biscuits and gravy as well as the steak and eggs. Did we mention that you can even get quail at the Counter Café to start your day? The quail and eggs comes with all-natural Texas quail and is served with a side of two farm-fresh eggs cooked any way you like, breakfast potatoes, and their mouthwatering homemade biscuit. A burger joint might be the last place that you’d think to look for breakfast, and yet Dan’s Hamburgers is here on our list. While Dan’s definitely knows how to serve up a mean burger (and you’re welcome to tuck into one for breakfast if you wish), their breakfast menu is substantial and appealing all on its own. 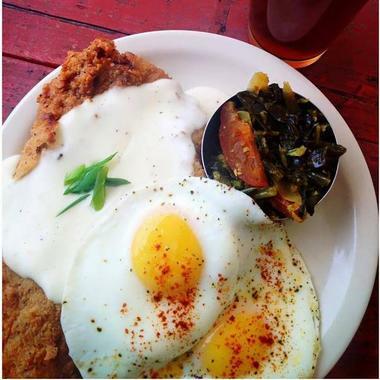 Dan’s serves classics like biscuits and some unexpected items like a breakfast taco. Suffice it to say that Dan’s makes sure they cover all of Central Texas’ bases when it comes the first meal of the day. Other offerings include pancakes, huevos rancheros and the Ruby Special. Situated in the lush grounds of Springdale Farm, the Eden East Restaurant is all about presenting their guests with an authentic farm-to-table dining experience. Though their claim to fame is their monthly prix fixe menu, it’s their a la carte breakfast, which is served on Wednesdays and Saturdays, that’s landed them on our list. Each month, their breakfast menu is developed and tweaked based on what’s available in Austin’s local farms and ranches. Of course, Eden East does their best to choose only the freshest and most vibrant seasonal ingredients that the farms have to offer. Enjoy all of their delicious offerings in an al fresco-style setting at large community tables that sit peacefully under a large and majestic elm. We bet you didn’t think you could get a French and New Orleans-style breakfast in Austin and yet you can, and a darn good one at that, at Epicerie. From Wednesday to Saturday, Epicerie dishes up all of the best that French or New Orleans-style breakfasts have to offer. The mouthwatering options range from something as small as a breakfast muffin to plated meals as hearty as pulled pork and brown rice or dishes like croquet monsieur. Some dishes you’ve just got to try are the eggs Roxanne, the cured salmon toast, their pastrami muffin, and their breakfast sandwich. If you’re coming for Sunday brunch, try an order of their duck and grits or go old school with a plate of their “Mad Dog” pancakes. 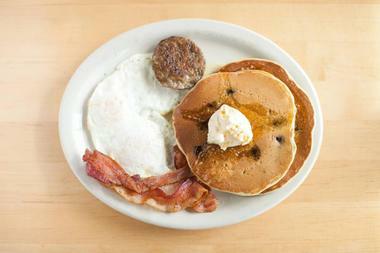 You’re in for a solid breakfast at Forthright Café. From their tasty but unconventional quinoa porridge to the hearty waffle sandwich packed with cheese, eggs, bacon and, of course, a generous pour of syrup, there’s always something new and delicious to sink your teeth into. With bright and welcoming interiors, it’s easy to understand why so many people love stopping by Forthright for breakfast. Apart from this, their extensive drink and coffee menu and their breakfast menu are full of classics and modern twists on crowd favorites. While all of their dishes are worth a try, some stand-out dishes are the wild mushroom toast, which features a variety of wild mushrooms cooked with creme fraiche and chives, served on thick-cut toast, and the fresh-baked zucchini bread. Who doesn’t love a good gravy? From dipping biscuits in to sopping it all up with some potatoes or hash, it can make or break a meal. 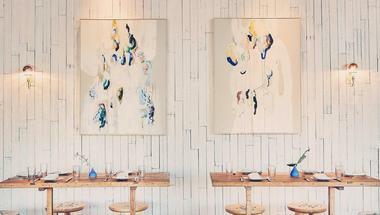 Good thing Chef Scott Sanders knows this and his aptly named restaurant, Gravy, makes just that. Real good gravy. A labor of love on Chef Scott’s part, his restaurant on wheels is beloved for serving traditional American breakfast classics. His savory butter and buttermilk biscuits are a crowd favorite and are made specifically to be paired with his signature creamy, meaty, and flavorful gravies. The gravies on his menu are absolutely delicious, with options like the Deep South, their house specialty, the Mid-Western, and the Border Crossing. In the mood for a big breakfast? Look no further than Joe’s Bakery and Coffee Shop. Huge breakfast plates of migas and huevos a la Mexicana are staples at Joe’s and will definitely make sure that you stay fueled the whole day. Don’t worry if you’re not into big breakfasts: Joe’s also has a wide array of baked goods for folks who like to nibble on a small breakfast or prefer to fuel their morning with a really good cup of coffee. Since 1962, Joe’s has been a go-to breakfast spot for Austin’s locals, with menu offerings like the Joey Rocha Plate, the Chicharrone Plate, and the Chorizo con Huevos Plate. 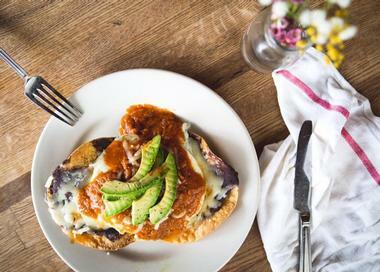 Located in the historic neighborhood of Clarksville, the Josephine House offers some of the city’s most beautifully curated breakfasts and brunches in all of Austin. The restaurant itself is found in the Clarksville Cottage, which features a small marble bar to enjoy your morning coffee at and a dining room with intimate tables and private nooks at which to tuck into your breakfast. If you want to enjoy your breakfast outdoors, you’re more than welcome to do so on the restaurant’s spacious and grassy front lawn. The menu utilizes the best that Austin’s local producers have to offer, with dishes like the lemon ricotta pancakes, the blueberry lavender buckwheat scone, the Nutella Morning Bun, and the grits and greens bowl. 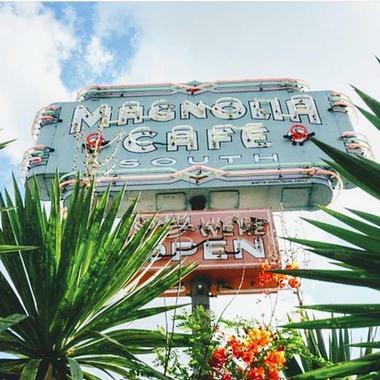 Situated on Lake Austin Boulevard, the Magnolia Café has been around since 1979, back when it was still known as the Omelettry West. Always ready for fun, the Magnolia became what it is today in 1987, when owner Kent Cole converted it into a 24/7 restaurant ready to serve up breakfast classics to all those who enter at any time of the day. One of the menu offerings to try is the salmon lox and eggs, which comes with scrambled eggs folded with cheddar/jack cheese and then piled high with smoked salmon, green onion, tomato, avocado, and some tangy sour cream. Another goodie is the Love Migas, which features an egg or tofu scramble that is cooked with spicy butter and is topped with tomato, onion, bell pepper, jack cheese, and tortilla chips. Owned and founded by Aurelio and Rosa Torres, Mi Madre’s Restaurant started in 1990 as a humble 10-seat taco shop. Today, their restaurant caters to hundreds of Austinites daily through a menu filled with outstanding Tex-Mex cuisine. If you’re looking for a traditional and absolutely flavor-packed Tex-Mex breakfast, Mi Madre’s definitely doesn’t disappoint. Try the ranchero breakfast plate, which has a pair of over-easy eggs that are topped with a tasty ranchero sauce and served with a side of carne guisada, home-cut fries, and refried beans. 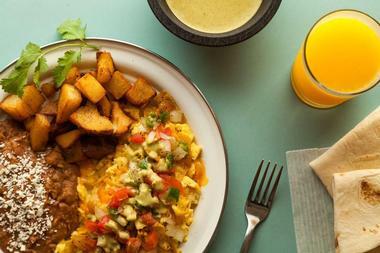 Another option to dig into is the New Mexico plate, which also has two over-easy eggs but is topped with a show-stopping green chili sauce and served with marinated pork adobo in addition to home fries and refried beans. Extra, extra, eat all about it! Some of Austin’s best breakfast sandwiches, hash, and French toast are coming out of a dedicated breakfast trailer and locals can’t get enough of it. Inspired by a passion for hospitality, coffee, and breakfast (again, the most important meal of the day! ), Paperboy offers its patrons a seasonal and curated menu featuring dairy and produce sourced from local farms. Steadfast in their dedication to stay as local as possible, Paperboy also sources their bread from local bakeries and serves hot and cold brew coffee from Tweed Coffee Roasters. Sink your teeth into crowd pleasers like the B.E.C., a buttermilk bun stacked with bacon, pimento cheese, and a sunny egg, or the sausage and egg, which also uses a buttermilk bun but has a goat sausage, mushroom relish, house mayo, and a sunny egg to top it all off. Whether you’re in search of your weekday breakfast or your weekend brunch, there’s always something good to chow down on at Patika. A friendly multi-roaster café in south Austin, Patika’s menu covers good ground in terms of the usual breakfast dishes, but always looks to add just a bit of a twist to each one. The seasonally rotating menu promises the use of the best and most flavorful ingredients that Patika can get their hands on. The café also holds fast to its commitment to make everything in-house, whether the customer is dining in or ordering their breakfast to go. Their menu includes modern classics like avocado toast, which is topped with a poached egg, sprouts, and a stunning jalapeño salsa, and healthy options like the quinoa bowl with kale, avocado, roasted carrots, parsnips, hummus, and a soft-boiled egg. What’s a breakfast menu without more decadent offerings though, right? One such offering is their pear waffle, which is served with brandied bacon, honey lemon mascarpone, candied pecans, and a spicy maple syrup. Yum! Ah, toast. One of the most magical and most crucial building blocks to any comforting and truly traditional breakfast. At Sa-Tén, a Japanese-style café located along Austin’s Springdale Road, they take a thick slice of this humble ingredient and transform it into something stunning and innovative yet familiar at the same time. For example, the Nori Tama Toast starts with a thick cut of toast (Japanese-style of course) that is then topped with an egg Kewpie mayo spread, green onion, mozzarella cheese, sesame seeds, and dried seaweed. Meanwhile, the Yasai Toast is jam-packed with vegetables like asparagus, broccoli, okra, bell pepper, and tomato while also featuring Kewpie mayo, a velvety anchovy garlic oil, and mozzarella cheese. While there are certainly other more familiar breakfast offerings on their menu, the toast is really where it’s at. Don’t forget to pair it with a great cup of coffee from their equally extensive drinks menu. 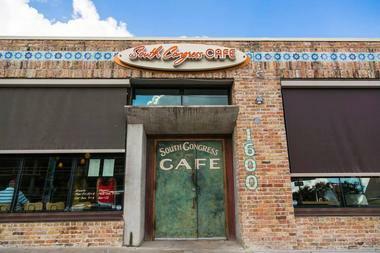 Feast on a Texan interpretation of a continental breakfast at the South Congress Café. The menu is truly distinctive, to say the least, with a meld of exotic and familiar dishes featuring ingredients like wild boar, venison, and quail. The South Congress Café believes in executing each dish with finesse and absolute expertise, and it’s their commitment to this that has people coming back for more. Try the eggs Benedict South Congress style, served with traditional hollandaise or chipotle hollandaise plus a smoked Gouda potato pancake. Choose between the traditional, crab cake, or fried tomato variations of the eggs Benedict while you’re at it. Other must-try menu offerings are the spinach portabella artichoke omelet, the migas and the carrot cake French toast. There isn’t anything overtly fancy or out of the norm at Texas French Bread. In fact, this restaurant/bakery has a pretty basic and simple menu. Maybe it’s the simplicity that makes Texas French Bread stand out, but at the end of the day, the only thing that matters is that they make incredibly delicious breakfast staples. Eggs, any which way you prefer, pancakes, and French toast are all dishes you can find on the menu. Recommendations for options to try out are the Bistro Breakfast, which comes with eggs, meat, toast, and potatoes, as well as the breakfast tostadas, which feature eggs, black beans, ranchero, and avocado. 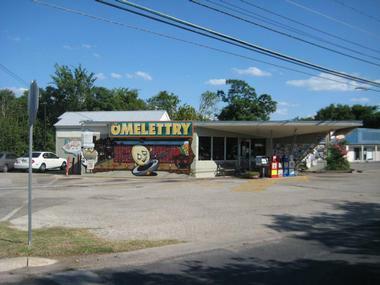 A classic Austin diner with a longstanding history, the Omelettry lives up to its name by dishing up some of the most delicious omelets that Austin has to offer. Each omelet is prepared with three eggs and the restaurant’s special combo of cheddar and swiss cheese. Not only that, but omelets are served with one of your choice of the following: soup and salad or a short stack of pancakes of your preference. Over its many years in the business, the Omelettry has gained praise for their buttermilk and gingerbread pancakes and other homemade delights in addition to their omelets. Even with the recognition and praise that the menu receives, the Omelettry continues to expand and innovate on their menu. Why not travel to another part of the world for breakfast at the Whip In Convenience Store and Pub? Serving up Indian takes on Southern breakfast classics, Whip In’s weekday breakfast offerings include items like the Mumbai Migas, which is served with cilantro chutney and basmati rice, and naan tacos. Eager to make sure that everyone feels welcome, Whip In also serves favorites like waffles and shrimp and grits. If you really want to taste this convenience store/restaurant has to offer, however, give their Daily Dal a shot along with their chicken and waffles, featuring a curry hollandaise and jalapeño maple syrup. When in the South, it’s impossible not to think of biscuits and gravy when the topic of breakfast comes up. There’s just something about a freshly baked biscuit smothered in a savory gravy and topped with gooey cheese that sends shivers up the spines of Southerners. Luckily, Biscuits and Groovy is all about this iconic combo. 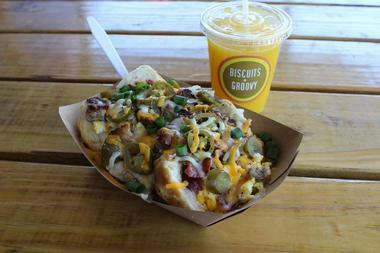 A trailer turned restaurant, Biscuits and Groovy focuses on all kinds of variations of the classic biscuit and gravy combo. What better way to start your day than with bestsellers like the Gloria Gaynor, which has biscuits, gravy, three scrambled eggs, thick-sliced peppered maple bacon, jalapeños, and colby jack cheese, or the second-best seller, the Johnny Hash. A huge and very busy eatery in South Lamar, Austin, Snooze is an A.M. eatery that was founded in 2006 in Denver, Colorado. 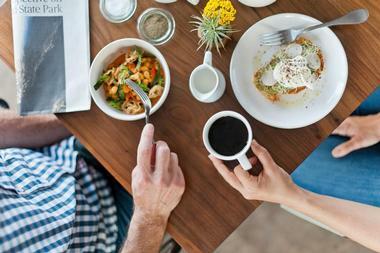 Its philosophy of great service and creative twists on America’s favorite breakfasts has brought the restaurant to several locations in the country, including two locations in Austin, Texas. While Snooze encourages its patrons to come up with their custom creations for a truly enjoyable breakfast experience, they also have their own concoctions and recommendations for the first meal of your day. One such option is the Breakfast Pot Pie, which has Snooze’s homemade rosemary sausage gravy smothered all over a crisp and flakey puff pastry and topped with an egg cooked any way you like. Don’t forget a side of their ultra-tasty hash browns!